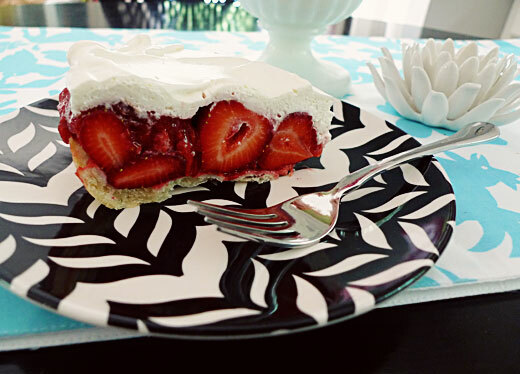 For me, fresh strawberry pie means one thing: Summer. It heralds the beginning of summer and bids farewell to spring. This is because fresh strawberry pie must be made with fresh, in season berries, preferably local. Unless of course you are desperate enough to work with the sad offerings in the grocery store, as I was a couple months ago. This is the same recipe I used to make my 8 pies over the weekend, and all recipients declared it good. Wash and hull the strawberries, pat dry. Mash enough strawberries to measure 1 1/2 cups. Mix together the sugar and cornstarch. Combine with mashed strawberries in small saucepan over medium-high heat. Stirring constantly, cook until mixture boils and thickens. Remove from heat, let cool 10 minutes. Place remaining whole strawberries in baked pie shell. Pour cooked strawberry mixture over the top, move berries around slightly to allow mixture to sink through (or just toss together in a bowl before adding to pie shell). Chill for at least 2 hours. Before serving, whip heavy cream and sweeten to taste with confectioner's sugar. Spread whipped cream on top of pie, and serve. If you're like me and have an addiction to creamy goodness, you can beat in a few ounces of softened cream cheese to the whipped cream. Note: This recipe is intended for fresh, local strawberries, which are usually sweeter than those you get in the grocery store. If you're using store-bought berries, or the ones you have just seem a little tart, you may want to add more sugar, an additional 1/4 to 1/2 cup.